We've reached the dog days of summer, which means it's time for the dog movies of summer. Four new releases try to make a last grab for summer box office glory in an uncrowded marketplace. First up is Invincible, which tells the story of Vince Papale, a Philadelphia bartender who won a spot on the Philadelphia Eagles' roster in the 1970s from an open tryout. 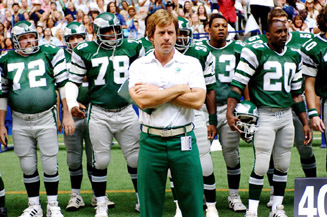 Played here by Mark Wahlberg, Papale's story tracks similarly to Jimmy Morris of The Rookie fame. Both films feature athletes getting their second chance from out of obscurity much later in life, and highlight that whole human spirit thing. An uncomplicated audience-pleaser, also akin to Rudy or even Rocky, Invincible could be the rare cross-over sports movie that attracts both male and female audiences. Wahlberg has become a solid mid-tier performer as a leading man of late, with last year's Four Brothers opening to $21 million, a very solid performance for an urban crime drama. Four Brothers' solid numbers came on the heels of The Italian Job's $19 million. Yes, Marky Mark has to be taken seriously now. Invincible should be able to capitalize on his leading-man starpower, as well as the buzz surrounding the upcoming NFL season. Opening on 2,900 screens, Invincible has a very good shot at winning the weekend with about $18 million. The Outkast duo of Andre 3000 and Big Boi have a movie debut together (though they've appeared in many films separately) in Idlewild, a hip-hop musical set in the Prohibition-era South. Drawing a lot of comparisons to Moulin Rouge, Idlewild looks to be a bold, stylish film, with plenty of action and romance. It also stars Ving Rhames, Terrence Howard and Macy Gray, among others, but it's Outkast's show, with their longtime video director Bryan Barber calling the shots here. It has, however, sat on the shelf for over a year, as Universal tried to figure out a way to sell the film. A supporting album from Outkast was released this week, though it features almost no music from the film. It's ultimately a strange-looking movie that will find its niche among both Outkast fans and modern musical fans, but its quite limited release on under 1,000 screens indicates the lack of confidence Universal has in the film. It should see a weekend figure of around $8 million. Beerfest is the third wide release feature from the Broken Lizard crew, after Super Troopers and Club Dread. Not to be confused with the execrable-looking Beer League, Beerfest centers around a secret beer-drinking Olympics in Germany. Wacky hijinks... sorry, shenanigans ensue, with the five members of the Broken Lizard troupe forming our heroes for the film. After Super Troopers opened to $7 million in 2001, Club Dread's $3 million was a major disappointment, though the comedy troupe has shown their ability to make their films on the cheap. This is probably the biggest reason they've gotten a third film. Beerfest looks to be an excuse to just let loose their ids, and should capture a good portion of its audience from the newly-minted Man Culture. However, Broken Lizard still remains largely a cult taste, and despite the wide release of the film on over 2,900 screens, will come in with about $6 million on the weekend. How To Eat Fried Worms is the fourth new film of the weekend, the latest from Walden Media. So far, this new production company has had one hit, with the first Narnia film, one medium success with Holes, and a lot more flops, including this spring's Hoot. This film, based on the children's book of the same name, looks to be more of the same. After arriving at a new school, a kid is confronted by a bully and through his process of fighting back, is tricked into a dare to eat ten worms in a day. This stand ends up becoming a potential turning point in the power structure of the school, and life lessons are learned by all.